In and around the ordeal with my cat last week, I managed to tour three graveyards. That would have made for an excellent week, if not for what was going on at home. As it was, the graveyards were my sanctuary. First I got to visit the cemetery at the old Mare Island Naval Shipyard, now an historic park. It’s a place I’ve wanted to visit since I first moved to San Francisco and found a flyer advertising it at the local tourist bureau. 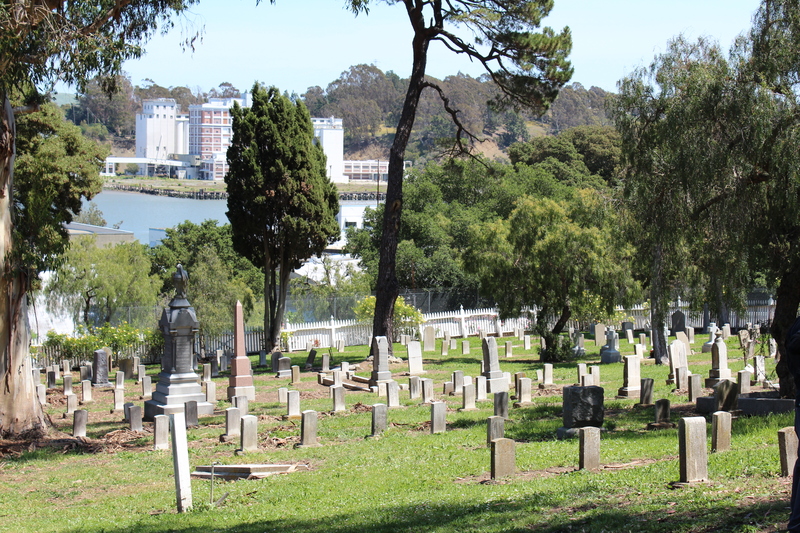 Since I’m setting up cemetery tours for the Obscura Society, Mare Island Cemetery was on the top of my list. The tour was slow in starting, since the docent got caught on the opposite side of the drawbridge leading out to the island — which meant we didn’t actually reach the cemetery until the tour was meant to be over — but she showed those people left all around and told us wonderful stories. Apparently there’s a bear (or maybe an anteater) buried in the graveyard! 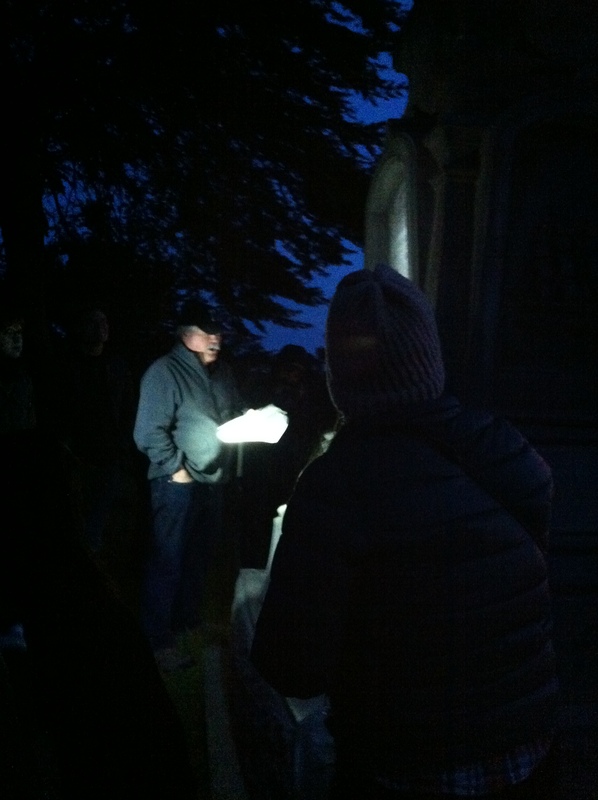 On Tuesday night, the Obscura Society gathered again for a flashlight tour of the Lincoln Park golf course, former site of the City Cemetery. It was beautiful to see the vestiges of the old graveyard in the twilight. It wasn’t spooky at all, even with hundreds of unclaimed bodies still in the ground beneath our feet. I loved to see people clustering around the old Seamen’s Union monument, their faces aglow in the flashlight beams. The two tour guides were great storytellers. I love touring with the Obscurans, because people are always so engaged and full of great questions. Finally on Saturday my family drove around the bay to the Alamo Cemetery in Danville. 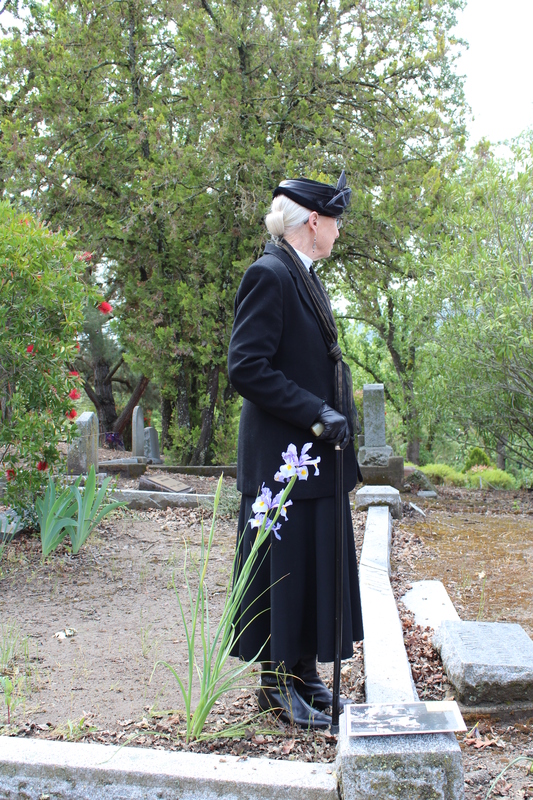 This pioneer cemetery dates back to the 1850s, when six-year-old Callie Chrisman was buried. Docents from the Museum of the San Ramon Valley dressed up in costume and spoke as some of the pioneers, including a woman who’d walked across the country from Tennessee — and narrowly missed being trapped with the Donner Party. It had poured heavily in Danville on Friday, so the steep cemetery paths were a little slippery. Two days later, the treads on my shoes are still full of cemetery dirt. I see that as the perfect antidote to the week I had. This entry was posted in Morbid adventure, Travel adventure and tagged Atlas Obscura, Bay Area Cemeteries, Cemetery tour, Obscura Salon, San Francisco. Bookmark the permalink.